You can enjoy the peace and tranquility as well as a taste of country living while vacationing at Birch Point Resort. We are located less than 100 km. west of Thunder Bay, Ontario on Highway 11. We are situated on Kashabowie Lake. Kashabowie Lake is approximately 17 miles long. You can fish for walleye, small mouth bass, northern pike and lake trout. Reel memories that last! 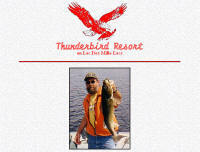 Located less than 100km west of Thunder Bay on Kashabowie Lake. Great fishing for walleye, smallmouth, northern pike and lake trout on our 17 mile long lake. We have 8 clean cabins to choose from which are all fully equipped. Small store on site. Boat and motor rentals available. Enjoy the beauty of a wilderness setting with all the comforts of home at Big North Lodge in Minaki, Ontario. At Big North Lodge you will find a cedar main lodge and 6 cottages all situated along the shoreline to allow a beautiful view of the water. Our camp, with a maximum capacity of 30 guests, is small enough to be considered your own private fishing lodge, but has the advantages of personalized service and hospitality offered by your hosts. Enjoy the beauty of a wilderness setting with all the comforts of home. Fully modern cottages, comfortably furnished, can accommodate 2 to 6 people and as many as 10 to 12 in our large 4 bedroom cottage. All have propane or electric heat, electricity, hot and cold running water, private bathroom with basin, shower, tubs and flush toilet. Thunderhook Fly-Ins Outdoor enthusiasts or first-time wilderness seekers alike will find the adventure they’re in search of when choosing Thunderhook Fly-Ins. Located in the heart of Ontario’s Wabakimi Wildnerness Provincial Park, Thunderhook Fly-Ins guarantees every get-away will be fascinating, affordable, and exhilarating. Waters rich with Walleye, Northern Pike, and lake trout, make this premier fishing destination a must for every angler. Eight remote cabin destinations are available in the secluded and quiet Canadian wilderness for explorers who desire the solitude and peace from a fly-in outpost. Resort accommodations at the fly-in Smoothrock Camp nestled along Smoothrock Lake, offer a less isolated experience and several amenities. Availability and variances of lodging choices make it easy for families, friends, individuals, and large groups to customize their vacation to the exact environment they are seeking. Aside from fishing attractions, Thunderhook Fly-Ins has access to 3-million acres of prime moose hunting grounds located in the depths of Wabakimi Wilderness. After being delivered by float plane to an outpost, hunters may choose to venture alone or with the leadership of one of Thunderhook’s accomplished guides. Fully equipped camps include a boat, fuel, and all the necessary basics to sustain a hunting camp. Harvesting a moose is nearly hassle free as the moose will be flown back to the float plane base and stored in a cooler for the remainder of the trip. The Missinaibi River watershed provides World Class Fishing. The species of fish found in our area include: Walleye, Northern Pike, Smallmouth Bass, Brook Trout, Sturgeon, Fallfish, Yellow Perch and Catfish. Housekeeping Units contain almost everything you have at home including: living room with T.V., fully equipped kitchen, 3 piece washroom with hot and cold running water, separate double occupancy bedrooms (each with a door). To make your visit with us even more memorable, try some exquisite wild game and gourmet meals in our L.L.B.O. licensed restaurant on the south shore of beautiful Shallow Lake. Each gourmet meal is created with pride and care. Our recreational facilities include: baseball, horseshoes, volleyball, badminton, playground, private swimming beach, sauna, and Jacuzzi. Take a refreshing walk on one of our many trails to enjoy the splendor of our back country including spectacular sights overlooking the nearby Missinaibi River. 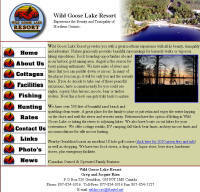 A wilderness, drive-to resort near Geraldton in north western Ontario. 12 Housekeeping cottages, good fishing for walleye, northern pike and perch. There are boats on outlakes for further fishing opportunities. Nice quiet family resort where you can enjoy canoeing, hiking, berry and mushroom picking or just relaxing on our beautiful sand beach. We have fall hunting for black bear, moose and grouse. Also available are boats, motors, bait, small store, landromat and a R.V trailer park. We have over 500 feet of beautiful sand beach and sparkling clean water. Nearby Geraldton boasts an excellent golf course as well as shopping..